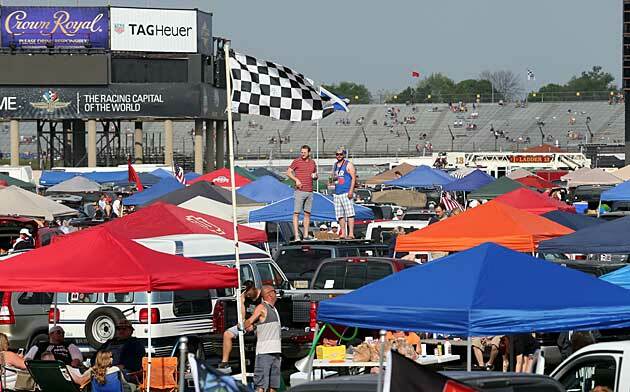 Indy 500 blog from Indianapolis Motor Speedway by SI.com's Andrew Lawrence. 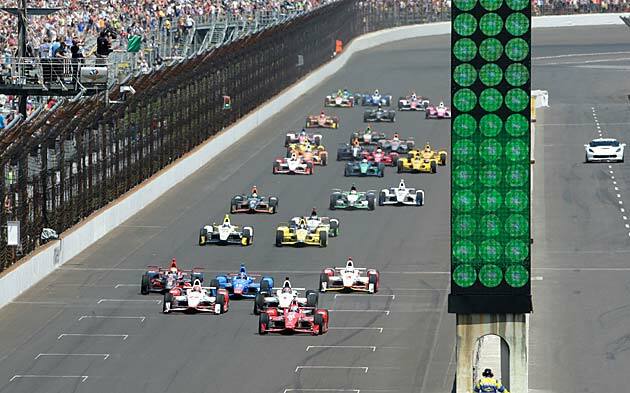 INDIANAPOLIS — Well, we got the race I suspected we might—a pitched battle between IndyCar's super teams, Penske and Ganassi. 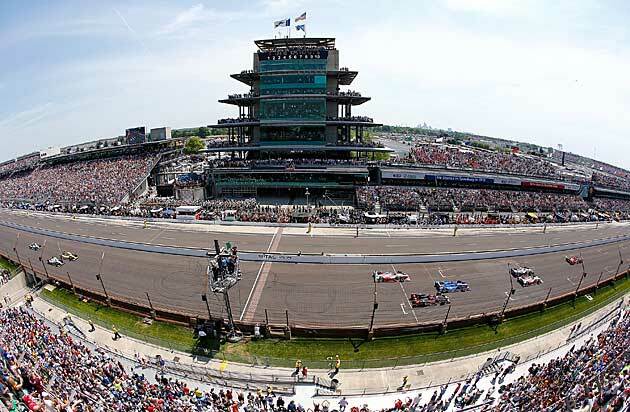 That Penske came out on top is no surprise; with the victory, the organization extended its Indy 500 advantage over its chief rival to 16 to 10 and snapped a five-year drought, an eternity in their shop. No, the real shocker is that the man who spearheaded this effort was the 39-year-old Juan Pablo Montoya, long thought to be past his prime. When he returned to IndyCar in 2014, after a disappointing stint in NASCAR, his stock was arguably at its lowest point. He appeared to lose his touch for open-wheel racing as he spent half of that season trying to hang with the pack. A late season rally, starting with a win at Pocono, was an encouraging sign, but few would see it for what it was: the start of something big. Especially with such a talented trio of teammates—Will Power, Helio Castroneves and Simon Pagenaud—surrounding him. Teammates who, by the way, have yet to take any significant time off from this series. And even when Montoya opened this season on a hot streak, winning the IndyCar opener at St. Pete and finishing on the podium in two of his next four races on the way to seizing an early lead in the point standings, he never quite looked like the man to beat. Power (the reigning series champion) and Castroneves (the third-ranked man in the points) seemed like they’d overtake him eventually. But by rallying from 30th place to the top three and outdueling Power, Pagenaud and Ganassi's best hope of a Borg-Warner trophy, pole-sitter Scott Dixon, down the stretch, Montoya showed that he's still very, very much in the conversation as one of the greatest drivers of his generation. That he was able to reiterate as much while pulling off his most daring pass of the day on an entry for Ganassi—which, incidentally, was his employer during that ill-fated adventure into stock car racing—well, one-upmanship doesn't get much better than that. I live blogged the event, so my newest posts are at the top. If you want to see how the day unfolded, scroll down to the bottom and read your way back up. 3:34 p.m. — And the winner is ... Juan Pablo Montoya, who boldly grabbed the lead with four laps to go after Will Power and Scott Dixon bumped slightly in a furious duel for the top spot. His margin of victory—.1046 of a second—was the fourth closest in the event’s storied history. And it was a 1-2 Penske finish: Montoya and Power. It's an incredible win by the Colombian, who rallied all the way back from 30th place to the front to claim his second Indy 500 win in 15 years. That might be one of the great comebacks ever seen at the Brickyard. Montoya, who started 15th, wound up 30th early on after an unplanned pit stop due to damage on the rear of his car. He also blew some precious time when he overshot his pit box on lap 95. 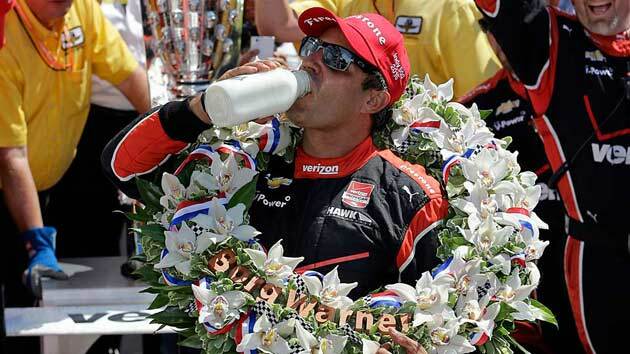 The winner of the 2000 Indy 500, Montoya now owns the record for the longest time between victories. 3:28 p.m. — With 10 laps to go we're seeing Scott Dixon and Will Power battle for the lead. Dixon would seem to have the edge, as he's stronger in Turns Three and Four. Juan Pablo Montoya in the mix. Every time I try to type something, the lead changes. It's still Power's race, but only until I finish this sentence. 3:25 p.m. — Underway again. Will Power and Scott Dixon swapping leads with 13 laps to go. Stefano Coletti and Jack Hawksworth have been treated and released from the med center. Sebastian Saavedra has an apparent foot injury and is being treated. 3:10 p.m. — Penske cars weave through traffic on the restart. But then a huge accident: Sebastian Saavedra, Jack Hawksworth and Stefano Coletti. Debris everywhere but none of the cars went airborne. Meanwhile a Honda, that of Andretti Autosport's Carlos Muñoz, has crept into fourth place—the highest positioning of the day for the manufacturer. 3:07 p.m. — We're under way again. We've had 30 lead changes and nine different leaders so far. Wrecks have taken Sage Karam, Ed Carpenter, Oriol Servia, Bryan Clauson and Tony Kanaan out of the race. 3:02 p.m. — With 27 laps to go, we're under yellow for debris on racetrack. Dale Coyne Racing’s fallen pit crew member Greg Senerius was treated, checked, cleared and released, by the way. The other, Daniel Jang, was taken to the hospital. What courage and luck these guys have to have to do the jobs they do. Will Power, Juan Pablo Montoya, Scott Dixon, and Simon Pagenaud the top four as we head for restart. 2:53 p.m. — With 100 miles to go, Tony Kanaan’s wreck opens things up a bit up front, but only for another Ganassi car, Charlie Kimball's, to slip into the lead. Kanaan was checked and cleared by Medi staff, by the way. 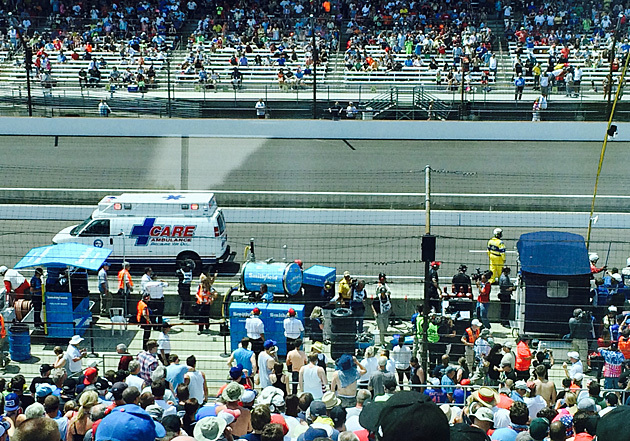 2:42 p.m. — Tony Kanaan in a hard crash into the wall on Turn 2. Safety crew on the scene. He's quickly out and looks O.K. but his day is over. He'd asked for a downforce change and team owner Chip Ganassi just said on the race broadcast that that the car's feel might have caught Kanaan off guard. Call it the first aero kit related accident of the day. And count the fact that the car didn't go airborne and Kanaan walked away as a very good thing. 2:36 p.m. — Race leader Scott Dixon reporting an increase in wind gusts in Turn 2. The air is a lot easier for him through Turns 3 and 4, where he's quickest round the bends. 2:26 p.m. — Simon Pagenaud and Scott Dixon dueling for the lead. 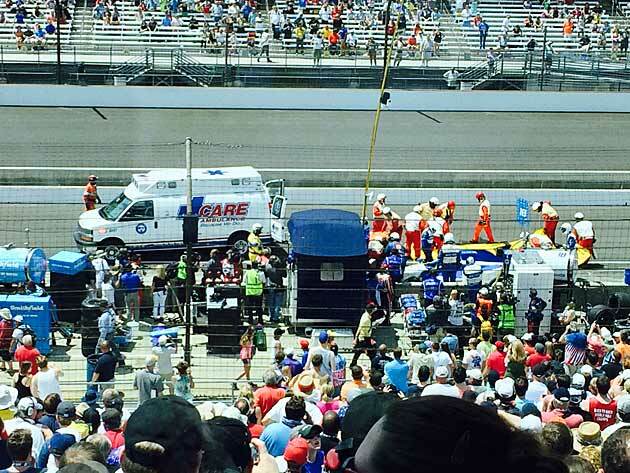 Oriol Servia checked out and released after collision with Ed Carpenter. 2:22 p.m. — Back in action. Will Power grabs the lead from Simon Pagenaud on lap 127. 2:19 p.m. — Still under caution for the Ed Carpenter crash and a pit road contact mishap involving three Dale Coyne Racing teammates. 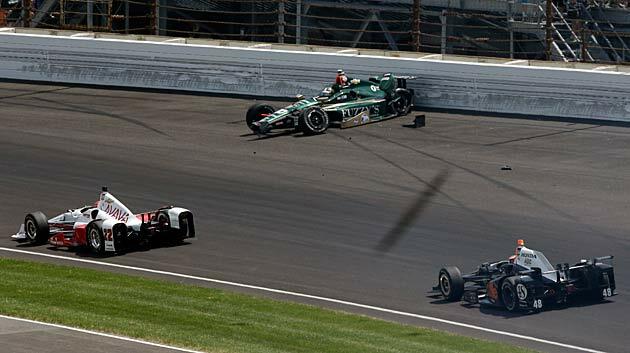 James Davison hit two of Tristan Vautier’s crew members while trying to avoid Pippa Mann as he left his stall. Carpenter has been checked out and cleared. Ambulance taking Coyne crew members Greg Senerius and Daniel Jang. 2:04 p.m. — Simon Pagenaud, who has led 20 laps today, still in front. Jeepers—Juan Pablo Montoya up to third now, while his Penske teammates Will Power and Helio Castroneves drop ever so slightly. Ed Carpenter has crashed. Under caution now, the third of the race. Two cars into the wall on Turn 1: Carpenter and Oriol Servia. 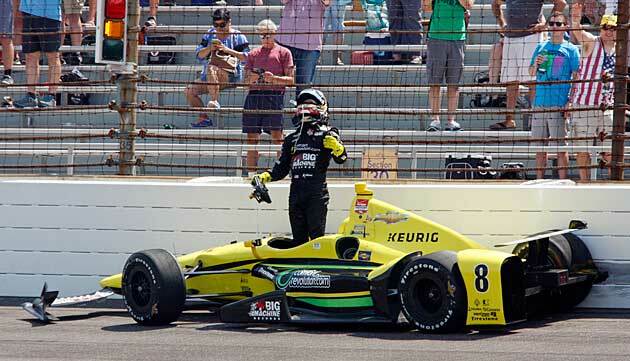 Tough luck for Ed, who led this race last year and looked like he was going to win it until he was taken out in a blind three-wide curve by James Hinchcliffe. 1:56 p.m. — We're halfway home. Simon Pagenaud leading followed by Tony Kanaan and Will Power. Temperature on the track is a balmy 116. 1:49 p.m. — We've had five leaders and 14 lead changes so far. 1:36 p.m. — Lap 72 and trash (hot dog wrappers, cups etc.) is flying around in Turn 2. Tony Kanaan now with a burst that carries him from third to first. Ganassi was a loser to Penske again in the pits as Simon Pagenaud beat Scott Dixon out of his box to take over as race leader until being caught by Kanaan. Average speed: 222 mph. 1:28 p.m. — Bryan Clauson gets loose going into Turn 4 and slams into the wall, bringing the race under yellow. The timing would seem to favor the Ganassi cars, which have three cars in the top six. Charlie Kimball (sixth) just joined Scott Dixon (first) and Tony Kanaan (second). Wouldn't be surprised to see Kimball gain a spot on pit road. His team finished runner-up to Helio Castroneves's in the Carb Day pit stop competition. 1:18 p.m. — On lap 54 Scott Dixon still leading but Simon Pagenaud, who's up to second, is gaining. This could be because Dixon is sacrificing a bit of speed to stretch his fuel window. We'll see if he can keep up that strategy, and his advantage, as he faces lap traffic. 1:11 p.m. — We're 100 miles in and just when it seemed as if JP Montoya, who had surged all the way from the back to the lead, was about to rebound from his calamitous start to the race he misses the mark on his pit stop and wastes precious time. Marco Andretti, whose grandpa Mario's two-seater bears the Sports Illustrated logo, is in seventh. Says his car is sensitive to the temperature. It's 82 degrees here today. 1:03 p.m. — JP Montoya is clawing his way back to the front on lap 34. After being sent to the back of the pack to serve his pit road penalty, he's up to 21st, just six spots back from where he qualified. 12:58 p.m. — On lap 27, Scott Dixon leading again followed by Tony Kanaan, Simon Pagenaud, Will Power and Helio Castroneves. Don't look now, but Gabby Chaves is climbing up to the front—no surprise, given how quick the rookie had been over the past two weeks. After starting 26th, he's up to 19th and just less than .7 seconds off of the pace of James Jakes, who's just in front of him. 12:49 p.m. — Single file ... green flag ... here we go again. Scott Dixon on the lead. 12:47 p.m. — Start waved off again. Stat of the race so far: 10 yellow flag laps, zero green, average race speed 87.759, two drivers (Sage Karam, Conor Daly) done for the day. 12:40 p.m. — Takuma Sato and Pippa Mann just sent to the back of the pack for pit road violations ... Restart nixed after JP Montoya and Simona de Silverstro circle around for servicing. Looks like she made contact. JP's right rear bumper pod is hanging on by a thread. Crew fixing it. Meanwhile, Sage Karam on his collision with Sato: "I didn't think he [Sato] was dumb enough to try to pass me on the outside.."
12:38 p.m. — Still under caution. Sage Karam was checked out by the on-site docs, cleared and released. Conor Daly's fire was caused by an overheated exhaust sytem. That's two drivers out and Juan Pablo Montoya's car has some damage as well. Sage Karam reacts after his crash. 12:25 p.m. — Conor Daly, the 25th-place qualifier and son of the aforementioned Derek, was slow to get out of his starting block. When he finally got rolling, a plume of smoke could be seen spewing from the back of his car. No exact word on what the failure is yet, or whether it's minor enough to allow him to return from the field. The only certainty is what a shame it is for him to open this race in this fashion. He's an Indiana boy, after all. ...unfortunately for Alex Tagliani he can't get his car into gear....and Conor Daly’s is on fire. 12:10 p.m. — The stars are out at the Brickyard and, keeping with racing tradition, they've been swiftly put to work. Earlier today, Pacers forward Paul George delivered the green flag via helicopter. Patrick Dempsey, aka McDreamy, will wave it. Champion gymnast Nastia Liukin is performing grand marshal duties, while three-time Sprint Cup Jeff Gordon will pilot the pace car before flying off to Concord, N.C., to run in the Coca-Cola 600. And then Jordin Sparks performed the national anthem. She may as well add it to her setlist, considering how much she sings this tune. D-Backs games, Pro Bowls, Super Bowls—she's sung it everywhere. And why not? She nailed it again. waving the green flag, and much, much more. The weather is good, the field is deep and, literally, anything can happen. We'll certainly do our best to keep track of all of it here. If you see something that we don't, say something (best to go through Twitter, where you'll find me at @by_drew) and we'll make an attempt to incorporate your choice finding. If we can't work it in, it's not because we mean to offend. It's because the action moves quickly here, as all you veteran watchers doubtless know and all you newcomers in the audience will soon see.